Kyrgyz President Sooronbay Jeenbekov landed in Germany in April 14 for a two day official visit. The trip is Jeenbekov’s first to Germany after becoming president in 2017 and comes almost exactly four years after his predecessor, Almazbek Atambayev, made the trek to Germany. The results of the trip were modest, pointing to an even keel in relations; never mind the turbulence of Kyrgyz domestic politics. Landing first in Munich, Jeenbekov attended the Kyrgyz-German Economic Forum, spoke at the Hanns Seidel Foundation and met with Bavarian state leaders. While the clear core of the Munich leg of Jeenbekov’s trip was economic matters — 11 bilateral documents were signed between Kyrgyz and German companies at the forum — the Kyrgyz president’s remarks at the Hanns Seidel Foundation centered on security, democracy, and development. “We know from the experience of modern Kyrgyzstan that building of a true democracy is not easy. But this is the only way that our people have chosen. 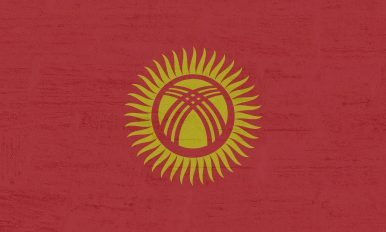 Currently, there is political and social stability in Kyrgyzstan. This gives us the opportunity to set ambitious goals for the medium term,” Jeenbekov said. Kyrgyz political stability is in the eyes of the beholder, perhaps. The day before Jeenbekov’s April 14 flight to Europe, his main challenger in the 2017 election aborted plans to return to Kyrgyzstan from Russia for the first time in the year and a half since the polls. Omurbek Babanov’s self-imposed exile and fear of arrest should he return to the country is just one facet of Kyrgyzstan’s tumultuous contemporary political scene. The party that nominated Jeenbekov, the Social Democratic Party (SDPK), is in the middle of a split. One faction is firmly standing with Jeenbekov’s predecessor, with whom he’s had a nasty falling out with, and the other with Jeenbekov’s proxies (in a quirk of Kyrgyz political set-up the president suspends political party membership when in office). As Jeenbekov’s administration pursues legal action against key members of the previous administration and parliamentarians float plans to revoke presidential immunity from Atambayev, the political ground in Kyrgyzstan is far from stable. This isn’t to say the system is in peril, but rather to underscore that nasty domestic political dramas are storm clouds on the horizon as Kyrgyzstan looks toward parliamentary elections in 2020. After Munich, Jeenbekov headed for Berlin to meet with national German leaders including Merkel and German President Frank-Walter Steinmeier. In a joint press conference following their meeting the two leaders — Jeenbekov and Merkel — made complimentary statements lauding the development of the bilateral relationship and aspirations for deeper ties particularly in the economic sphere, but also in hydropower, agriculture, tourism, education and other fields. Regardless of what was said behind closed door, the public statements point to continuity in the relationship between Germany and Kyrgyzstan. Meanwhile, on Monday in Romania (which holds the EU presidency), the pending adoption of the new EU Strategy for Central Asia was marked with a high-level conference. The previous strategy was set back in 2007 and the EU has been working on an update. While the updated strategy has not been unveiled yet, the conference’s focus on connectivity and sustainable development are undoubtedly key aspects of the strategy. if convicted, Sapar Isakov faces up to 20 years in prison on corruption charges levied under heavy political clouds.